A sedative is a substance that depresses the central nervous system (CNS), Sedatives can be referred to as tranquilizers, depressants, anxiolytics, soporifics, sleeping pills, downers, or sedative-hypnotics. Sedatives can be abused to produce an overly-calming effect (alcohol being the classic and most common sedating drug). At high doses or when they are abused, many of these drugs can cause unconsciousness and even death. Doctors and nurses often administer sedatives to patients in order to dull the patient’s anxiety related to painful or anxiety-provoking procedures. Although sedatives do not relieve pain in themselves, they can be a useful adjunct to analgesics in preparing patients for surgery, and are commonly given to patients before they are anesthetized, or before other highly uncomfortable and invasive procedures like cardiac catheterization or MRI. They increase tractability and compliance of children or troublesome or demanding patients. Patients in intensive care units are almost always sedated unless they are unconscious from their condition. The intricate purple flower pictured above was shown to be as effective as sedatives in the benzodiazepine (valium) family, the aerial parts of this herb are great for nervous tension and anxiety. In recent research, passion flower extract at 45 drops daily (tincture) was shown to be as effective as oxazepam (similar to valium). This nervine herb is also “antispasmodic” which makes it great for people with constant nervous twitching. This is probably one of my favorite herbs, which is why it got the award for “Best Herb of 2007.” Unlike most of the herbs on this list that are designed to be taken at night or at least late afternoon, both Ashwagandha and schisandra (listed below) are terrific “adaptogenic” herbs that help us tolerate our stressful days that much better. You can make some tea, or grab some capsules of the organic root and take two capsules twice a day. This herb is specifically intended for those that are exhausted and agitated or debilitated by stress. In Ayurvedic medicine, ashwagandha is a renowned anti-aging and rejuvenating herb. Referred to as “Chinese Prozac” this herb is commonly unappreciated and underutilized in American herbal practice. Schisandra is a terrific daytime adaptogen herb and should be taken as is recommended with Ashwagandha, two capsules with breakfast and lunch, or a cup of tea in the morning and afternoon. The berries can be made into a nice aperitif for those with a low libido. 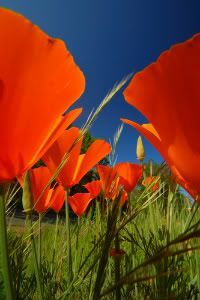 The bright orange flowers of the California poppy, leaves and other aerial parts are sedative, anti-spasmodic, and mild pain relievers. This is also a gentle herb used for colic and agitation in children. Do not use this herb or any other sedative herbs in pregnancy. No, I am not recommending that you drink more beer to calm down. However, the herb commonly used to make beer bitter also works as a sedative. It is extremely bitter though so is best given a small part in your herbal tea formula for insomnia or stress. Do not combine with prescription sleep aids due to an additive effect. A well known Polynesian psychotropic sedative, this herb is sedative and “spasmolytic” and thus helpful for chronic pain conditions. Several conflicting studies debate the safety of using this herb with alcohol. Liver damage is thought to occur if used in large doses in conjunction with alcohol. This research, however, was used to scare many people away from using kava kava for whatever reason. People need to simply remember that herbs are medicines and that a herb with actions similar to prescription sleep aids and analgesics will, of course, pack the same side effects. A strong herb demands respect. When used ceremoniously, or occasionally this herb does not run the risks it runs when it is heavily abused. The best way to safely use kava kava is in an organic tea form. Look for a tea blend that includes kava, or makes your own. This herb should not be used in large doses, and large doses should not be used over a long term. Do not combine with alcohol, or use during pregnancy or nursing. Chronic abuse will result in a horrible scaly skin rash. Try adding lavender to your favorite baked good recipe. Purple lavender flowers will offer a sophisticated herbal makeover to your favorite shortbread cookies, or white tea cakes. Lavender is great in your herbal medicine blend, and can also be used to stuff pillows, or as an aromatherapy stress reliever throughout the day. Lavender should not be used in pregnancy due to its emmenagogue effect. Also known as “Melissa officinalis” this herbal sedative should not be used by those with hypothyroidism as it inhibits the thyroid and is used to treat hyperthyroidism, however for everyone else it is a common simple herb to grow in your garden and make into your own calming sedative tincture each summer. Do not use this herb in pregnancy. I grow lemon balm in my garden and harvest it, rinse it, let it dry and then pack it in a jar with enough room for it to swim around in some vodka. Shake the jar once a day for two weeks. The vodka will extract the constituents and after a few weeks you can strain out the plant part leftovers and put a half a teaspoon of this liquid “anxiety medicine” in a little bit of water when you need something to calm you down. Although we think “depression” the second we hear about St. J’s Wort, we also need to address that depression and anxiety tend to walk hand in hand and this herb is not just an anti-depressant it is a mild sedative as well. St. John’s Wort has also been shown to have a lower risk of side effects than conventional anti-depressants and is worth trying for those that don’t quite have severe enough depression to mandate the use of a prescription pharmaceutical, but instead need something to take the edge off and boost the mood a bit. If you are suffering from anxiety that has a form of depression associated with it, then this would be a great herb to consider in your herbal sedative blend pending that you are not on any anti-depressants or anti-psychotic medications. The condition “serotonin syndrome” may occur from combing this herb with those classes of medications or other herbs and supplements that boost neurotransmitter levels. This herb should not be used by those on oral contraceptives, or any medications as it increases the cytochrome p450 enzyme system which results in a more rapid detoxification of drugs from the system. The drugs or birth control pills are then rendered useless. The standard dose of St. John’s Wort for those not on any other medications, is 300 mg three times daily of the 0.3% standardized extract. Not traditionally recognized as a sedative, but as a mineral source and blood thinner, this “cooling” herb calms the system and has a special affinity to the lungs, throat, and salivary glands. This is a terrific balancing herb to include in your herbal sedative blend as the dried flower blossoms make for a beautiful addition to a glass teapot. Do not use in pregnancy, or if on blood-thinning medications. Not just for cats. Catnip is actually a gentle nervine herb for humans. No, it won’t make you roll around on the carpet or chase after things (at least not to my current knowledge) but it is still a great mild sedative. This herb should absolutely NOT be used during pregnancy, as most herbs should never be used during pregnancy without checking with your naturopathic midwife, however, it can safely be used in children by making a very weak tea. Be sure to only give your children organic herbs and check with their pediatrician or naturopath prior to use. Definitely one of the more potent herbal sedatives, valerian is also a great painkiller for those with chronic pain. Some people prefer not to use this herb because it can cause quite the herbal hangover the next morning and most complain that it makes them feel really groggy, or desire to sleep through the day. Look for a tea formula that includes a bit of valerian to avoid the hangover, and if you have severe anxiety, chronic pain, or insomnia talk to your naturopathic doctor about using this at a more therapeutic dose. Always use organic root. The perfect herb for fried and frazzled mothers; it strengthens a weak heart and is great for nervous palpitations. Motherwort is best taken over a prolonged period of time, and because it is a uterine stimulant, it should not be used in pregnancy. A bitter, cooling sedative herb that is best used for nervous fear, restless sleep, and is also thought to lower blood pressure. This herb is great for people with the inability to pay attention—huh what was that? And has been used effectively to calm down children with ADHD. Some kids concentrate better when they are sped up, and some do better when they are calmed down. One of the most common kitchen herbs, chamomile is a great mild sedative and digestive bitter. Be careful in using chamomile tea if you experience ragweed allergies, formally known as the “Asteraceae family” and previously recognized as “composite family.” If you have a history of seasonal allergies you should exercise caution. If not, make your tea up strong, use a heaping tablespoon and not a teaspoon per 8 oz cup of water, and allow to steep 15 minutes covered. If you don’t cover your chamomile tea you will lose the calming essential oils to evaporation. Only elitist herbalists know to do that. Welcome to the club! Establishing a nighttime or daytime tea ritual is a great way to reduce stress, avoid binge eating, and help those that fight insomnia get to sleep at a decent hour. Don’t forget to have your pot of tea with one of my favorite “Bedtime Snacks for Insomniacs.” Also if you tend to be one of those that gets troubled by having to use the restroom in the middle of the night, be sure to drink your tea at least 90 minutes prior to your expected bedtime. For most of these herbs simply make a tea with about 1 tsp (milder herbs use a tablespoon) to 8 oz cup of boiling water. Allow to steep covered 15 minutes. Or if you aren’t a tea drinker just look for a pre-made organic herbal formula to take in tincture or capsule form, and follow the manufacturer’s recommendations. All sedatives can be abused, but barbiturates are responsible for most of the problems with sedative abuse due to their widespread “recreational” or non-medical use. People who have difficulty dealing with stress, anxiety or sleeplessness may overuse or become dependent on sedatives. Heroin users take them either to supplement their drug or to substitute for it. Stimulant users frequently take sedatives to calm excessive anxiety. Others take sedatives recreationally to relax and forget their worries. Barbiturate overdose is a factor in nearly one-third of all reported drug-related deaths. About half of all the people admitted to emergency rooms in the U.S. as a result of the nonmedical use of sedatives have a legitimate prescription for the drug, but have taken an excessive dose or combined it with alcohol or other drugs. Others get sedatives from friends who have authentic prescriptions or by using fake prescriptions.